Aim: The study was aimed at evaluating the efficacy of cryosurgery in the management of oral mucosal lesions. Time taken for healing, postoperative pain, secondary infection, and recurrence of lesion was evaluated. Materials and Methods: A total of 30 patients with oral mucosal lesions were included in the study. The patients were evaluated for pain and postoperative infection which was documented on the 1st, 3rd, 7th, 21st day after the procedure. Other parameters such as healing time and scarring were assessed at 21st day. Recurrence of the lesion was evaluated in the 3rd and 6th postoperative month. All these data were statistically evaluated. Results: The pain and swelling which reduced mainly during the 7th postoperative day which was highly significant. The discomfort of the patient was relatively less. Only three patients showed delayed healing out of all patients. Recurrence of lesion was noted in two cases which conclude to about 6.7%. Conclusion: The cryosurgery is overall a better modality for treatment of oral lesions as it is more reasonable with adequate success. The procedure is relatively more acceptable and has shown to have a faster recovery. Oral mucosal lesions are usually categorized into surface lesions generally involving the epithelium and superficial connective tissue of mucosa. These lesions include first white, pigmented, and vesicular-ulcerated erythematous lesions; second, reactive soft-tissue enlargements which may increase and decrease (fluctuate) in size and usually eventually regress and thirdly soft-tissue tumors which are characterized by being persistent and progressive which do not resolve without treatment. In the treatment of oral mucosal lesions, surgical modality is considered as golden standard. There is still a need for evolution of atraumatic bloodless procedure, which could give, same or better results than surgical modality. Various methods of tissue destruction have been employed in past which includes chemicals, irradiation by X-rays, and high-frequency electric current and many others. Ideally, any technique in competition with the surgeon's scalpel should be painless, producing minimal damage to the surrounding tissues, being selectively localized and readily controllable to promote rapid and uneventful healing. Cryosurgery is one of such modalities which fulfills most of the above-mentioned criteria. Cryosurgery is not simply the application of freezing temperatures to tissue. The aim of cryosurgery is to kill and destroy cells. This study was designed to investigate the role of cryosurgery in treating various oral benign mucosal lesions such as mucocele, fibroma, leukoplakia, erythroplakia, and lichen planus prospectively. The study was aimed at evaluating the efficacy of cryosurgery in the management of oral mucosal lesions based on healing time, postoperative pain, postoperative edema, incidence of secondary infection, frequency and duration of application, recurrence of lesion, and cost-effectiveness. The present study was conducted on the 30 patients comprising of both the sexes who were ready to give consent for the study. The patients were selected on the basis of inclusion and exclusion criteria which are mentioned as follows. Patients of all age group with benign intraoral epithelial lesions without infection were included in this study. Patients with cold intolerance having Reynaud's disease or with a history of diabetes and gross infections were excluded. Patients with cryoglobulinemia, cold urticaria or undergoing hemodialysis or immunosuppressive therapy were also excluded from the study. The cryosurgical apparatus used was Cryo Model 004 on-off super deluxe, manufactured by Basco Cryos Company, which was based on Joule–Thomson principle. The nitrous oxide gas was used to achieve a temperature of −89°C at the probe tip. Different types of probes were used based on the area of application and size of lesions. The cryoprobe was connected to the cylinder and pressure was maintained between the pressure range of 40–70 kg/cm 2 with the help of pressure gauze. The flow of gas from the cylinder to the probe was controlled by hand switch [Figure 1]. Clinical treatment was documented with the help of photographs and evaluated with the help of questionnaires. Pain (evaluated with VAS scale [Figure 2]), swelling, and postoperative infection were evaluated and documented on the 1st, 3rd, 7th, 21st day after procedure. Other parameters like adequacy of healing and scarring were assessed at 21st day. Recurrence was evaluated in the 3rd and 6th postoperative month. Nitrous oxide was used as the cryogen from a high-pressure cryoprobe of the “Cryosurgical unit” based on the freezing by gas expansion principle at −89°C. The assistant retracted the region to be frozen and held it firmly. The lesion was kept moist for proper contact of the probe. The tip of the cryoprobe was made to contact the tissue by activating the cryoprobe. The indicator of pressure gauge was kept at 600–1000 lb/sq. Inch range to ensure adequate supply of N2O. A white ice ball was formed on the contact site. Once the freezing started the probe got attached to the tissue with the formation of an ice ball which could not be separated until the thawing was carried out. Thawing was done by deactivating the cryogun. A 2 min freezing cycle was given for each application, and two such applications were made on each area with interval of 4 min for thawing. Postoperatively, all the patients were prescribed analgesics (SOS), and antibiotics were not prescribed. Patients were advised warm saline rinses/chlorhexidine mouthwash after 3 days of the cryosurgery. 8–10 = Severe pain – When the patient felt severe pain and either reported back or took stronger analgesics. This scale was used for the subjective assessment of the magnitude of pain felt by the patient. It was evaluated on 1st, 3rd postoperative day and 1st, 3rd postoperative week. 1 - Presence of infection. 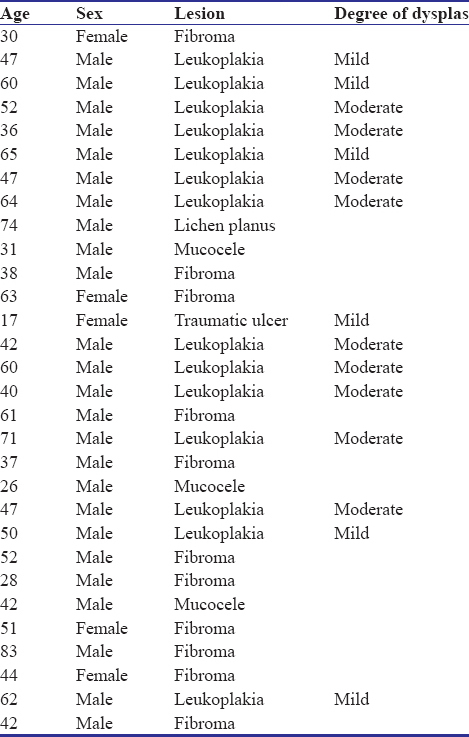 In this study, thirty patients were treated with cryosurgery over a period of 2 years which included 25 (83.3%) men and 5 (16.7%) women aged 17–83 (mean-48.4) years [Table 1], [Figure 3]a and [Figure 3]b. Cryosurgical procedure was performed on a variety of benign oral mucosal lesions which included 14 (46.7%) cases of leukoplakia, 11 (36.7%) cases of fibroma, 3 (10%) cases of mucocele, 1 (3.3%) case of lichen planus, and 1 (3.3%) case of traumatic ulcer [Figure 3]c.
In the present study, 2 (6.7%) of the patients had no pain, 12 (40%) had mild pain, 15 (50%) had moderate pain, and only 1 (3.3%) patient reported with severe pain on the 1st postoperative day. 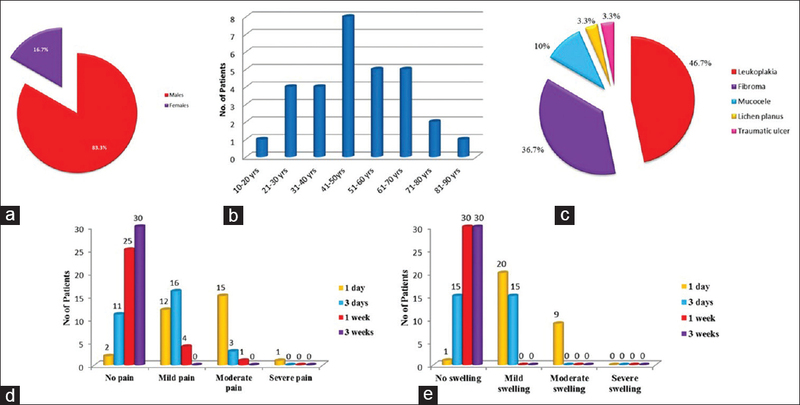 The intensity of pain gradually decreased on the 3rd postoperative day with 11 (36.7%) patients having no pain, 16 (53.3%) patients with mild pain, and 3 (10%) patients with moderate pain. On the subsequent follow-up on 7th postoperative day, 25 (83.3%) patients reported with no pain, 4 (13.4%) patients with mild pain, and 1 (3.3%) patient with moderate pain. After 3 weeks, all the patients had no pain. There was a gradual reduction of pain, and it was statistically very highly significant (P ≤ 0.001). In one case of lichen planus, pain and burning sensation disappeared from the 1st postoperative day [Figure 3]d.
In the present study, 27 (90%) of the lesions healed normally within 3 weeks except for 3 (10%) patients with delayed healing where epithelization was complete during the 4th week. The mean value of healing was 21.20 ± 2.355 days. The delayed healing in the 3 cases was due to the use of large diameter cryoprobe with increased depth of penetration leading to larger area of necrosis and delaying the healing time. In the present study, recurrence was observed in 2 (6.7%) cases. Recurrence was noted in one case of lichen planus after 6 months and in one case of mucocele after 3 months. Recurrence in the patient with lichen planus was due to constant denture irritation which relieved after he stopped using the denture. Recurrence in the case of mucocele may be due to decreased depth and size of the ice-ball formed leading to failure of the complete necrosis of the involved minor salivary gland. The patient was not ready for subsequent cryosurgery, so surgical excision was done. In our study, 1 (3.3%) patient had no swelling, 20 (66.7%) patients had mild swelling, and 9 (30%) patients had moderate swelling on the 1st postoperative day. On the 3rd postoperative day, reduction in swelling was evident with 15 (50%) patients having no swelling and 15 (50%) patients having mild swelling. One week postoperatively, all the cases had no evident swelling. There was a gradual reduction of swelling from 1st postoperative day to 1 week postoperatively which was statistically very highly significant (P ≤ 0.001) [Figure 3]e. The clinical photographs are presented as [Figure 4] and [Figure 5]. Cryotherapy is a controlled and targeted destruction of diseased tissue by the application of cold substance in situ., There is some disagreement regarding the exact temperature that must be reached to destroy mammalian cells reliably because of the technical difficulty of measuring the tissue temperature after freezing. When considering the different techniques and agents used for cryosurgery, a reasonable assumption is that a temperature of at least −20°C must be reached. There are various mechanisms of action for cell death after freezing which can be divided as direct and indirect effects. The first is the direct or cellular effect, by intracellular and extracellular crystallization whereas secondary or vascular effects are due to the increase in vascular permeability, capillary liquid extravasation to the outside of the cell leading to cell death. It is also believed that immunologic effects are operative because this procedure can stimulate the host's immune system. Fast freezing is more destructive than slow freezing because it promotes intracellular ice formation and more extensive damage to protein membranes. During thawing, cells at the periphery of the cryolesion will take up excess electrolytes. To equalize this gradient, water enters the cell and can lead to swelling and lysis, which explains why thawing, as well as freezing, may be an important determinant of cell destruction., Slow thawing is associated with recrystallization of ice and is more destructive than rapid thawing. Cells near the probe tip are cooled rapidly to a very low temperature, whereas those at the periphery cool more slowly and less profoundly, being in intimate association with a continuous heat source from the local blood vessels. Lethal effect of thawing indicates that repeated cycles of freezing and thawing are potentially more destructive than a single freezing of long duration. These effects can be obtained by overlapping the frozen areas in treatment and by allowing thawing to proceed without assistance after removal of the probe which was considered in our protocol for using cryotherapy as treatment modality. The mouth is reasonably accessible to cryosurgical apparatus. The warm moist surface of the oral mucosa is well suited to the application of a freezing probe., Clinically, cryosurgery has primarily been applied for the treatment of leukoplakia and hyperplastic, granulomatous, vascular, pigmented, and salivary gland lesions.,, Cryosurgery has also been used to treat trigeminal neuralgia. The two methods for application of cold are, an open system with use of a liquid nitrogen (−196°C) spray or a cotton tip and a closed system with use of probes and gases such as nitrous oxide (−89°C), carbon dioxide (−78°C), and freons (fluorinated hydrocarbons with a low boiling point). In the present study, closed system apparatus based on Joule–Thomson effect was used and nitrous oxide as a cryogen. This apparatus has been used to treat minor oral lesions with satisfactory results as it provides better control with quick freezing of the required region. Moreover, it is convenient to use as it is lightweight, portable and can be controlled with on-off switch. Bekke and Baart treated ninety patients with various benign and malignant lesions of the oral cavity using cryoprobe using a single application of probe for leukoplakia with good results. This study did not follow thawing as a protocol in treatment which was against our current study. Emmings et al. treated several patients of hemangioma, hyperkeratosis, and leukoplakia with cryosurgery using repeated cycles of freezing and thawing similar to other authors who agreed on freeze/thaw cycles to have better results which were also observed in our study.,, In a study conducted by Bansal et al. treated lichen planus, leukoplakia, mucocele, ranula, and hemangiomas of the oral cavity using cryosurgical probe also agreed on thawing. Owing to such extensive support, thawing considered in our treatment protocol. Yeh treated 92 patients who had 102 benign oral lesions which comprise of 25 oral leukoplakia, 36 mucocele, 20 hemangiomas, 3 fibromas, 2 lichen planus, and 6 verrucous hyperplasias without any postoperative pain in most of the cases. Prasad et al. treated twenty patients of mucocele and twenty patients of leukoplakia by cryosurgery and found all of the patients had mild pain postoperatively. Narula and Malik treated 34 patients with benign lesions lichen planus, mucocele, leukoplakia, pyogenic granuloma, ranula, hemangioma, and fibroma. Mild pain was present in all cases postoperatively. Yu et al. treated sixty patients with oral leukoplakia using cotton-swab cryotherapy and found that all patients had mild pain and only three patients complained of severe pain postoperatively. Cryosurgery being a painless procedure was confirmed by many authors apart from the above-mentioned studies who also treated several patients of oral hemangiomas, hyperkeratosis, and leukoplakia ,,,, All these studies including our study concludes that postoperative pain in cryotherapy is relatively less. Swelling after cryosurgery is due to accumulation of exudates which begins soon after complete thawing and reaches its peak in a day and then gradually reduces which was confirmed by studies in the past.,, Hyperemia and edema of the treated area began to appear immediately after cryotherapy, and the swelling increased for 1–2 days in accordance to many and remained for 2–3 days. Narula and Malik treated 34 patients with various benign oral lesions and observed mild swelling postoperatively. All these studies support our results. Leopard treated 300 patients with cryosurgery and followed up for 3 years. He found no recurrence in granulomatous, hyperplastic lesions, and mucous cysts. Out of 40 patients treated for leukoplakia, two cases had recurrence. Bekke and Baart treated 7 cases of lichen planus with follow-up of 1–27 months and found recurrence in 3 cases. In 24 cases treated for leukoplakia, follow-up was done for 1–10 months and 6 cases had recurrence. Yeh treated 92 patients with oral lesions and followed them up for 3–46 months. He found recurrence in 8 cases of leukoplakia, 2 cases of mucocele, and 4 cases of verrucous hyperplasias. Yu et al. in their follow-up of 5–31 months for sixty patients with leukoplakia found recurrence in 5 cases. All these above-mentioned studies support the ratio of recurrences in our study. Cryosurgery is a very safe, easy to perform and relatively inexpensive technique for treating various oral lesions in outpatient clinic. It is an atraumatic form of therapy in comparison to conventional surgery. It is very useful for oral lesions as the oral mucosa is humid and smooth, which makes it an ideal site for freezing. With the recent development of better equipment, this mode of therapy appears to have a promising role in the management of benign mucosal lesions. Thus, its simplicity in application and the absence of postoperative infection, scarring and little or no recurrences makes cryosurgery a highly useful method in treating various conditions of the oral cavity. Chan MH, Wolf JC. Biopsy techniques and diagnoses & treatment of mucocutaneous lesions. Dent Clin North Am 2012;56:43-73, vii-viii. Prasad M, Kale TP, Halli R, Kotrashetti SM, Baliga SD. Liquid nitrogen cryotherapy in the management of oral lesions: A retrospective clinical study. J Maxillofac Oral Surg 2009;8:40-2. Bansal A, Jain S, Gupta S. Cryosurgery in the treatment of oro-facial lesions. Indian J Dent Res 2012;23:297. Schmidt BL. The use of liquid nitrogen cryotherapy in the management of the odontogenic keratocyst. Oral Maxillofac Surg Clin North Am 2003;15:393-405. Yeh CJ. Simple cryosurgical treatment for oral lesions. Int J Oral Maxillofac Surg 2000;29:212-6. Sharma VK, Khandpur S. Guidelines for cryotherapy. Indian J Dermatol Venereol Leprol 2009;75:S90-100. Ishida CE, Ramos-e-Silva M. Cryosurgery in oral lesions. Int J Dermatol 1998;37:283-5. Farah CS, Savage NW. Cryotherapy for treatment of oral lesions. Aust Dent J 2006;51:2-5. Emmings FG, Koepf SW, Gage AA. Cryotherapy for benign lesions of the oral cavity. J Oral Surg 1967;25:320-6. Ameerally PJ, Colver GB. Cutaneous cryotherapy in maxillofacial surgery. J Oral Maxillofac Surg 2007;65:1785-92. Leopard PJ, Poswillo DE. 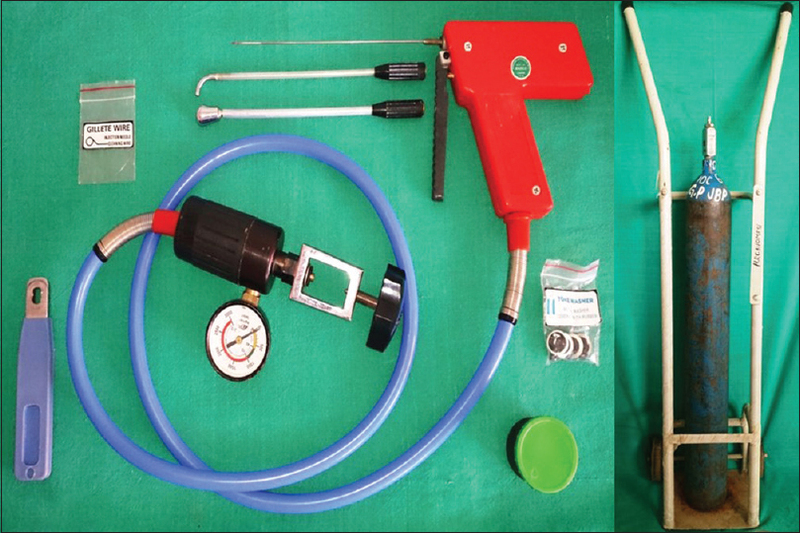 Practical cryosurgery for oral lesions. Br Dent J 1974;136:185-96. Narula R, Malik B. Role of cryosurgery in the management of benign and premalignant lesions of the maxillofacial region. Indian J Dent Sci 2012;4:63-6. Toida M, Ishimaru JI, Hobo N. A simple cryosurgical method for treatment of oral mucous cysts. Int J Oral Maxillofac Surg 1993;22:353-5. Sunitha J. Cryotherapy – A review. J Clin Diagn Res 2010;4:2325-9. Leopard PJ. Cryosurgery, and its application to oral surgery. Br J Oral Surg 1975;13:128-52. Bekke JP, Baart JA. Six years' experience with cryosurgery in the oral cavity. Int J Oral Surg 1979;8:251-70. Yu CH, Chen HM, Chang CC, Hung HY, Hsiao CK, Chiang CP, et al. Cotton-swab cryotherapy for oral leukoplakia. Head Neck 2009;31:983-8. Marcushamer M, King DL, Ruano NS. Cryosurgery in the management of mucoceles in children. Pediatr Dent 1997;19:292-3.